Dementia is an illness that touches more and more of us, I think. As the population of Australia ages, and as we live for longer and longer, too many of us have a direct experience of dealing with loved ones suffering from this terrible problem. My beloved grandmother died two years ago as a result of her dementia, and I am interested to read Sharon Snir's new book, which promises to be an intimate (and, I imagine, familiar to many) portrait of the unbelievable pain of re-negotiating a relationship with a dementia-afflicted parent. A seeringly honest yet inspirational memoir of how dementia changed a family in ways they never could have imagined. 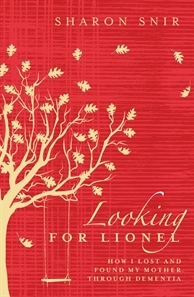 Looking for Lionel is a warm, insightful memoir about how dementia entered Sharon Snir's family and left them struggling with fear and sorrow. As Sharon shares her inspirational story, she invites you into her world of laughter and tears. Written for family and friends of those with the disease, it helps readers regain their courage and find the joys of relating in the here and now.